Years of conflict have exacted a heavy toll on centuries of history in the Gaza Strip. While traces of its rich past remain, the race to preserve what is left beneath the surface of this battle-scarred land is fraught with problems, as Ruqaya Izzidien reports. Settled by civilisations spanning some five millennia, Gaza has been built layer-upon-layer since the Bronze Age. As each era ended, its people left behind remnants of their times - churches, monasteries, palaces and mosques, as well as thousands of precious artefacts. "Underneath Gaza there is a whole other Gaza, but every archaeological site here is found by accident," says Hayam Albetar, an archaeologist at the Hamas-run Ministry of Tourism and Antiquities. "We found a Byzantine Church when workers were digging to build Salahedin Street and stumbled upon a mosaic." The ministry is the official body in charge of archaeological digs and artefact preservation - but their work has faced many obstacles recently. Its offices were damaged when the Abu Khadra governmental complex housing them was flattened by Israeli bombs during the conflict with militants in November. Many historical sites were also damaged during the hostilities, ministry officials say. "A bomb directly hit the Byzantine church during the last war, damaging its antique mosaic floors," said Ahmed al-Bursh, Deputy Minister for Tourism and Antiquities. Mr Bursh also said the Mamluk Al-Basha Palace and ancient walls in Gaza's old quarter were also cracked from indirect hits. Ministry officials say it will be difficult to repair the damage done to the Byzantine church, especially with short funds. As most restoration and preservation is carried out by the ministry, outside groups rarely offer any form of support, as to do so would associate them with Hamas - shunned as a terrorist organisation by Israel, the US, EU and others. For Hayam Albetar though, despite the adversities, working at the ministry is a labour of love designed to preserve as much of Gaza as she can. It is not only war that makes her job so hard. Israel strictly controls passage out of Gaza, for what it says are security reasons, and does not allow in machinery and other equipment which it suspects can be used against it by militants. "People working here can't travel for training outside and we are only able to use local tools, which don't allow us to excavate in a precise manner," Ms Albetar said . 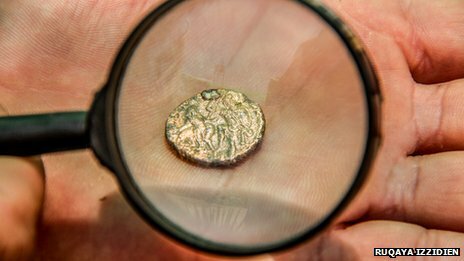 "Some excavation materials are considered dual use by Israel, so we cannot get the materials needed to clean and restore coins, for example." Today, the mosaics are - for the most part - kept covered by layers of sand, which Ms Albetar says is the best way to preserve them. Archaeological tools in Gaza are rudimentary - not ideal for the delicate task of unearthing fragile relics - and while local expertise is not poor, specialists from outside rarely visit. "Two months ago, when a man was digging near his house in Beit Lahiya in northern Gaza he uncovered a beautiful mosaic," said Ms Albetar. "He notified us, but we still aren't sure if we have discovered a church or a monastery as we've only unearthed a small section so far- we just know it is something huge." For hundreds of years, Gaza's port was the gateway to the Orient, exporting perfumes, grain, textiles and spices. The shoreline flourished, then waned, leaving behind a coastal archaeological treasure-trove. "On a calm day, you can see the foundations of Mayumas Port beneath the water and we have discovered coins, glass and pottery on these shores," said Salim, a local historian. Mayumas, a Roman trade port so large it hosted 10 churches, has long disappeared into the sand and been swept under the sea. "Very little has actually been discovered, when you compare it to what there must be hidden beneath our feet," explained Salim. "We don't really have the opportunity to go out and search for hidden historical ruins." Those ruins have sometimes revealed themselves. Two winters ago, during heavy gales, eight Roman columns were swept ashore; they were later identified as church columns from Mayumas Port. Beyond Gaza's archaeological fraternity, little attention is paid to what has survived from the past. Most Gazans are too preoccupied with high unemployment, poor housing and the restrictions on agriculture, fishing and importation to care about ruins and antiquities. History is everywhere though. 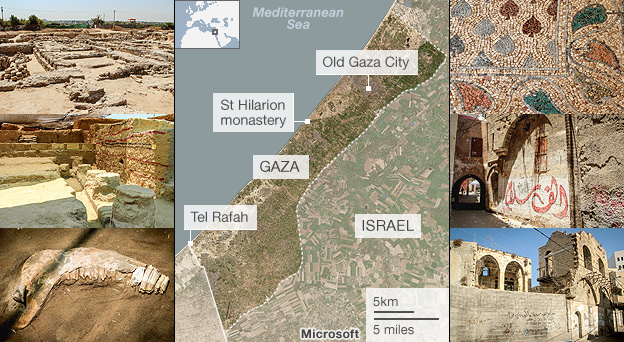 Gaza's old quarter is a hub of ancient buildings. A trip down any side-street will lead to sandstone structures from bygone times. Some - like the Al-Samra Baths and the Al-Omari Mosque, believed to be the site of the Temple of Dagon, pulled down by the biblical figure Samson - have been restored. But many ancient structures in Old Gaza City are dilapidated or filled with rubbish, and as Gaza's population expands, residents have resorted to building concrete extensions on top of ancient buildings. The human cost of conflict and bombings is always devastating. But with ancient sites becoming collateral damage and a blockade restricting the exchange of archaeological knowledge and tools, Gaza's rich history, spanning tens of eras and civilizations, risks being lost forever.